IpHost Review 2019: Is IpHost a Good Hosting? Since it was founded in 2001, hosting solutions provider IpHost has been one of the fastest growing hosting vendors in Greece. With 65,000 domains hosted for 25,000 customers, this vendor has time and again proved itself to be a noteworthy hosting company for Greece-based businesses. IpHost is a web hosting services provider based in Greece. Founded in 2001, this hosting solution vendor has grown to become one of the largest hosting vendors in Greece. They also have a significant presence in the United Kingdom, Georgia, Belgium, and Canada. IpHost is powered by 600 servers and hosts more than 65,000 domains for 25,000 customers. Their website is available in Greek and English. IpHost’s Spam Experts service is included in all its hosting plans, but it is disabled by default, so you have to contact the company in order to enable it. You can also request that they issue and install SSL for free if you use their hosting infrastructure (otherwise you have to pay). They offer simple server management and advanced server management for users who subscribe to the dedicated server solutions. For security reasons, IpHost will not give out the server root password that is known only by their technical support team. This can be a serious limitation for those businesses that would prefer to outsource server solutions to third-party security companies. IpHost uses Zabbix to monitor their critical services such as network protocols, system metrics, network infrastructure, servers, and applications. For websites with extreme resources and a risk of server overloading, IpHost can design your architecture to improve performance and availability while reducing cost and simplifying management. IpHost’s pricing is very affordable compared with other providers, and they offer a free hosting package (with no expiry) for all active domains under the IpHost system. They have simplified the process of upgrading and downgrading with a single click of a button, and they also offer free domain transfer plus a 30-day money-back guarantee. Customers can contact the professional and polite support team via telephone, email, live chat, and a ticketing system. The team is available 24/7 to help you with even the simplest hosting issues. They seem to have a profound knowledge of hosting, and they move fast to address customers’ support tickets. The only negative is that IpHost has yet to add a knowledge base or FAQ section to their website. IpHost is an ideal hosting provider for businesses of all sizes in Greece. With 600 servers, this vendor has the capacity to handle even the most complex websites for big corporations. 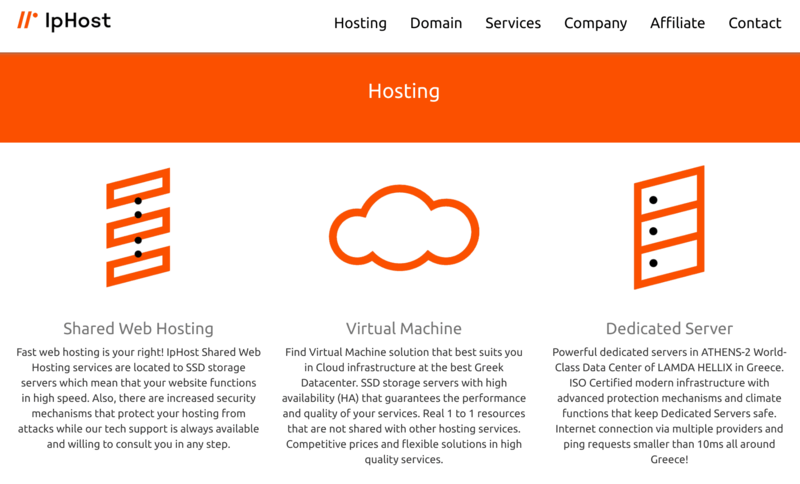 Wondering how IpHost stacks up against other Web Hosting companies? Enter any other Web Hosting company and we will give you a side-by-side comparison.